•	AAG’s Alsim FNPT II simulator is so good, even other flight schools train on it! AAG has developed relationships with specific Airlines in the region which are expanding and have an ongoing requirement for newly type-rated Pilots. We are a Pilot training academy providing specialist and innovative training solutions and operational support to the aviation community. We are passionate about what we do and what we believe in. This passion and enthusiasm inspires our customers and strengthens their confidence in us. To be the Pilot training provider of choice in the markets we serve, with the customer at the heart of our business. Our expertise is in building Pilot careers and futures: we help you to harness your passion and guide you on the path to your destiny. Our team of instructors, examiners and customer service staff has extensive experience in selecting, training and mentoring trainee Airline Pilots to become the best that they can be. Our facilities and equipment demonstrate the latest technologies available, and ensure that by the time you reach the flight deck of a modern commercial Airliner, you will feel comfortable, confident and competent at the controls. The Job of an Airline Pilot is probably one of the most prestigious, glamorous and exciting in the world. It is a highly rated and adventurous career choice, allowing you the opportunity to travel around the world to places most people only dream about. You must have a passion to want to Fly aeroplanes. You must have a desire to want the lifestyle that comes with the profession. Provided you have this passion and desire you will be rewarded with the most fulfilling of careers. You could not have picked a better time to train as a Pilot. A surge in the aviation industry has resulted in a worldwide demand for qualified Pilots. The Asia Pacific region requires more Pilots over the next 20 years than anywhere else in the world: 39% of the globe’s new Pilot demand will come from this region. This equates to 192,300 Pilots. Becoming an Airline Pilot is a dream many young people have, but for you it could be a reality. 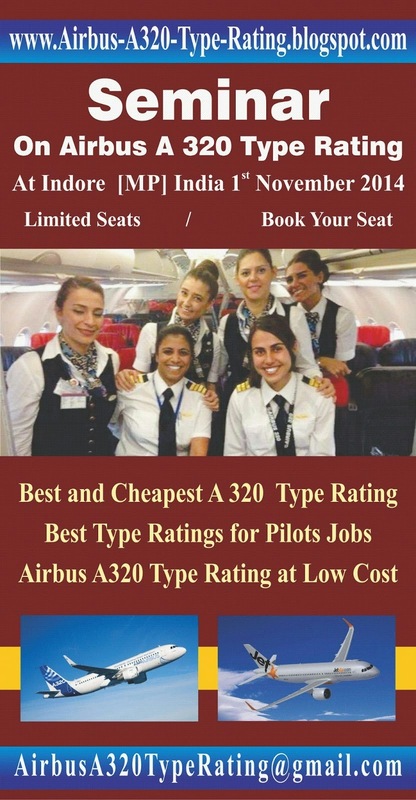 If you are a motivated and committed individual with a will to succeed, then this brochure provides you with the information about the Indian DGCA Airbus A320 Type Rating – an all in one package designed to provide you with everything you need to secure that first Airline Job. Now is your chance to follow your destiny. Good luck! Located in Clark Freeport Zone, Alpha Aviation Group Philippines (AAGP) is a leading provider of Airline Pilot training serving the Asia Pacific region. Pilot demand in this region is the highest of anywhere in the world. With AAGP’s unrivaled reputation and our extremely high graduate success rate with over 97% cadets gaining employment with Airlines, you could not choose a better school with whom to complete your Airline Pilot training. AAGP offers training to both newcomers to aviation and seasoned Pilots - from individuals with no Flying experience, through to major Airlines within the region. However, what sets us apart from the competition is not the high quality of training we deliver, or the fact we have the most up-to-date technology to help you learn. It is our whole ethos, our attention to detail, our dedication to safety and our determination to look after our customers – to ensure they get the very best the industry can offer. The AAGP Flight Line is located at Clark International Airport which has two parallel 3200m runways, full runway and approach lighting, ILS/VOR/DME approach aids and a full range of Air Traffic Control Services. Having an Airport with such equipment means we have the best training environment a trainee can wish for, in that it will fully prepare you for your future Flying career. AAGP is extremely well resourced in terms of facilities and equipment. Modern equipped classrooms with the latest training aids, a modern training fleet of Aircraft and simulators – including a state-of-the-art full motion Airbus A320, and Integrated Procedures Trainer which local Airlines use. With tens of thousands of hours between them, our teams of instructors provide a wealth of knowledge and experience gained from employment with Airlines, the military and general aviation training operations. Besides expertise in their particular field, AAGP appointed ground and flight instructional staff also provide mentorship to cadets individually to ensure close and careful monitoring of training progress. AAGP’s fleet consists of modern Cessna 172 Aircraft with digital computerized avionics (known as ‘glass cockpit’) various static simulators and a full motion highly realistic Airbus simulator upon which we deliver type ratings to major Airlines in the region. Capable and accurate Flying on flight instruments is a primary skill expected of an Airline Pilot, which is why our training fleet and equipment is aligned so closely with that found on the flight deck of a modern commercial Airliner. Training to be an Airline Pilot requires total commitment and a great deal of concentration over a long period of time. Being away from home with so much to absorb requires the strongest constitution. AAGP’s customer care is second to none, and no problem is too small. Our staff are here to support you with any non-training issues which may arise, leaving you free to concentrate on the more important matters as you progress through your training. AAGP has developed relationships with specific Airlines in the region which are expanding and have an ongoing requirement for newly qualified Pilots. Our training fleet consists of 10 Cessna 172 Aircraft - the world’s most popular single engine Aircraft that has been recommended as the best training Aircraft internationally for cadet Pilots. They are equipped with the Garmin 1000 avionics package, which makes the transition from light Aircraft to Flying a modern Airliner a whole lot easier. With tens of thousands of hours between them, our teams of instructors provide a wealth of knowledge and experience gained from employment with Airlines, the military and general aviation training operations. Besides expertise in their particular field, AAG appointed ground and flight instructional staff also provide mentorship to cadets individually to ensure close and careful monitoring of training progress. Each instructor has undergone a rigorous selection process to ensure that the highest quality and standards of teaching at AAG is maintained. We also deliver 1:1 tuition to our cadets at no extra cost to ensure that each Pilot can literally be the best that they can be. The academy is home to our Full Motion Level D Airbus A320 Simulator. The CAE device is the only one of its kind in the Philippines to be approved by both local (CAAP) and European (EASA) aviation authorities. We also house the Alsim FNPT II. This generic simulator is easily changed from a single to twin engine Aircraft at the click of button, and is certified to deliver Instrument Training. Making the transition from ground to the Air much easier for our cadets. Continuity of training is a fundamental element in ensuring a trainee Pilot achieves the highest possible results with minimum delay. To achieve such continuity, we have our own maintenance and engineering department. Our Aircraft Maintenance record is one of the best in the regions we serve. We have a maintenance motto of “replace, rather than repAir!’. When an engine requires and overhaul, we even send it to the UK to make sure that we keep our promise of offering the best Pilot training standards, that the industry can offer. Our Aircraft Maintenance Manager is also an ex Embry-Riddle University Graduate, which is the worlds largest, fully accredited university specializing in aviation and aerospace. He is a highly experienced professional who has worked across the globe specialising in Aircraft Maintenance. The Alpha First Officer Preparation program is intensive. In order to successfully complete the program and make the transition to your first Airline position, you will need to be 100% focussed on your training. This is why you can expect a warm, friendly atmosphere at our excellent campus. Our team are highly experienced and will do their best to cater to your individual needs. The restaurant offer an array of international cuisine, and are happy to customise your meal according to your requirements or tastes. They also offer various beverages and host a number of events such as movie night, so that cadets can socialize away from the pressures of Pilot training. We also have newly refurbished accommodation for our cadets to stay, with various room rates depending on your budget. Each room is cleaned on a regular basis, along with various checks for health and safety. Each room is equipped with complimentary Wi-Fi. Our modernised library is open 24 hours a day, 7 days a week, so that you can revise or study anytime that you wish. Cadets also have the option of relaxing in the student lounge where you can watch TV, read a book, play a game of pool or just hang out. We feel that downtime is just as important as working hard in the classroom. The campus also has a newly refurbished gymnasium that is equipped with a cardio theatre, weights/freestyle area and resistance machines. Being a Pilot can be a physically demanding Job, so staying in shape is important. Here at AAGP, we have the customer at the heart of our business. We regularly organise events and provide fitness programs for cadets to take part in. Our sports hall is host to a number of activities such as Basketball and Badminton, as well as weekly Zumba classes. Cadets can also take part in tournaments arranged by our team to find out who is the best at Table Tennis or Billiards. There is also a fully qualified nurse on site to attend to all of our cadets medical needs, should they require them. The academy also benefits from its location a few minutes from Clark International Airport, which allows easy access and the option to spend downtime taking a weekend or longer break exploring the famous pristine beaches and tourist spots of the Philippines or visiting nearby destinations such as Hong Kong and Macau. Away from the campus, Clark Freeport offers a vast number of restaurants (Pampanga is the culinary capital of the Philippines) as well as plenty of shopping malls with duty-free shopping, world-class golf courses, spas and recreational facilities at the many hotels. All of this makes AAGP the perfect place to study and learn to become a professional Airline Pilot. The complete one stop shop for securing that first Airline Job. All you need to progress to the next level.